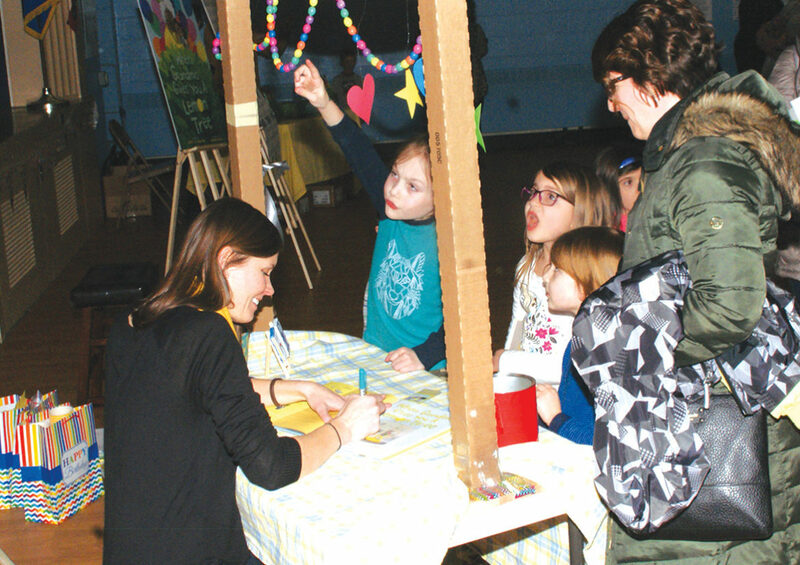 As Suffield author Jamie Bielonko Deenihan inscribes a newly bought copy of her new children’s book, When Grandma Gives You a Lemon Tree, Charlotte Boone, center, seems for a moment more interested in the decorations on the signing table, as are Eva and Tyler Upton. They were brought to the well-attended event at Spaulding School by Kristi Upton, right. Jamie Deenihan was a teacher and has always loved children and writing. She babysat for my grandchildren, and they loved her. A few years ago she decided to put those loves to work. She did not just start to write though, but did her homework. First she took a free course taught by Dawn Mitchell who gave her some good advice. One suggestion was to join the Society of Children’s Writers and Illustrators, a local writers group in Western Massachusetts. It is also a worldwide organization. Jamie also joined several writers groups both local and online. As you can see, she prepared well and acquired an agent and illustrator for her current book and books to come. I have read the book, and it was so sweet and gentle and with a message. Her book, When Grandma Gives You a Lemon Tree, was presented on March 5 to a huge crowd gathered at Spaulding School in Suffield. In addition to sales of her book, which she signed, (and it was a long line to wait in for the signing) there were tables of children making small crafts relating to the story which were sold for five dollars. They made 700 dollars which went to the Jimmy Fund. It was a very successful event, and in just three days the book went to a second printing. Jamie also went to a book signing in Wethersfield and will be going to other book stores. She is working hard to make sure the book is a success, but based on the responses so far, I don’t think she has much to be concerned about. Jamie accomplished all this while also raising a family with her husband Rick. She had always lived in Suffield, and Rick moved here when she was in first grade and he in second. They were always friends but started to date when they were in college and subsequently married. They have two boys Nathan seven and Alex five, and they are very excited about their mother’s book. When Grandma Gives You a Lemon Tree is being featured at Odyssey Bookstore in South Hadley, Mass., but can also be purchased at Barnes and Noble and at most book stores and also on line. 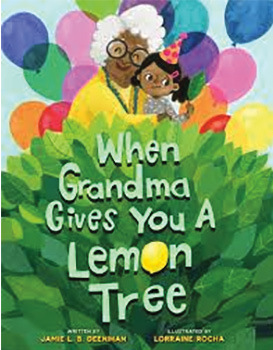 Look now for When Grandma Gives You A Lemon Tree by Jamie L. B. Deenihan, illustrated by Lorraine Rocha, published by Sterling Children’s Books, 2019. And expect soon Jamie’s next book When Grandpa Gives You a Toolbox.